Jessica Subject was one of the first authors I got to know through social media, and one of the first sci-fi romance authors I read. I’ve hosted her on my blog many times, but I’ve never interviewed her! Can you believe that? She has a new release, It Takes a Zombie Apocalypse, so this is the perfect time to remedy that. Cara Bristol: Why did you select science fiction romance as your genre? 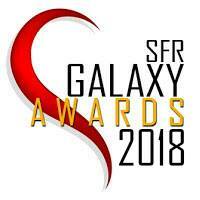 What about SFR appeals to you? Jessica Subject: I don’t know if I selected science fiction romance, or if it selected me. 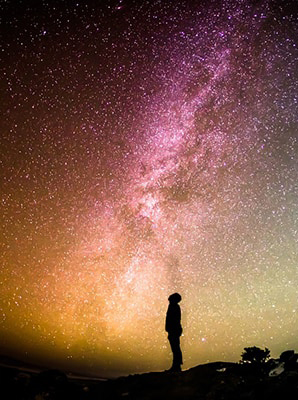 I mean, I’ve always been fascinated by the unknown, especially what exists beyond our planet, and our galaxy. Though no one in my family watched sci-fi shows growing up, I tried to view Star Trek: The Next Generation and a few other shows when the television wasn’t occupied. That was easier when we had a second television. For me, sci-fi romance embodies so many types of stories, and so many different interpretations. Now, not all tropes that fall under that umbrella appeal to me, but there are so many possibilities whether I’m getting lost in a story I’m writing, or one that I’m reading. 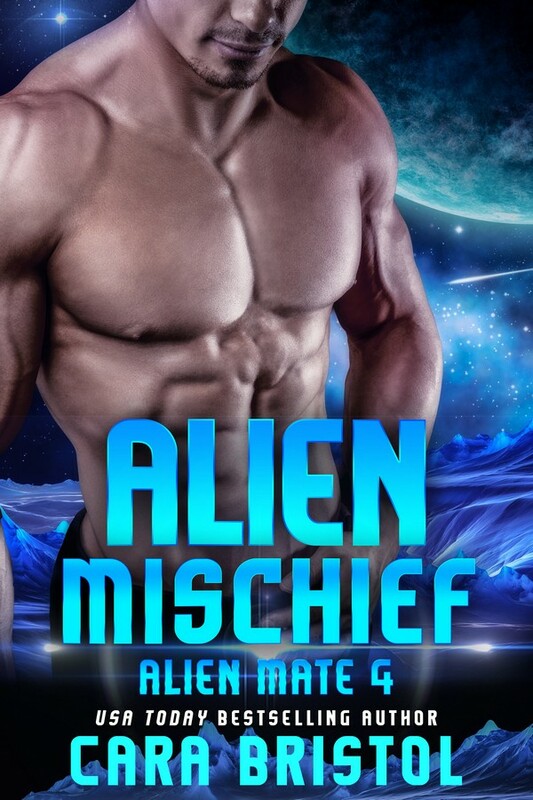 I love to find out how other authors imagine alien beings, life in the future, and space travel. Cara Bristol: Give us a brief history of your writing career. Jessica Subject: Though I’ve been writing romance stories since grade seven, I didn’t set out to write for publication until 2009. I connected with many readers through social media and wrote my heart out on a story about young superheroes. They became aliens hiding on Earth in a rewrite, and I started sharing snippets on an author hop called Six Sentence Sunday. (That’s how I first met Cara.) Another author involved in SSS told me about a sub call at her publisher and thought I could introduce my aliens to the world that way. So, I wrote Celestial Seduction and it was published in 2011. Since then, I’ve had several other stories published by Decadent Publishing, and in 2013, decided to try my hand at self-publishing. Currently, I have 27 stories published ranging from short stories to novellas. I also have 5 of my own anthologies, some of which include stories that are only available in that collection. Plus, I have stories in 7 multi-author anthologies. This year, I plan to expand my Galactic Defenders series with a couple more stories, and finish another story I started a couple of years ago. 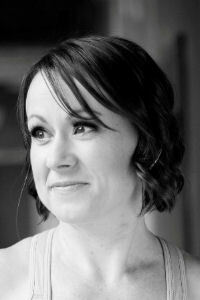 Cara Bristol: Since you started publishing, what changes in the publishing industry have had the biggest impact on you? How has that changed what you do? Jessica Subject: I think the biggest changes I’ve seen are how to get your book in front of readers. When I first started out, it was important for authors to do blog tours, and have a blog of their own. Then Facebook parties became the way to find new readers, especially if you invited to be a part of a multi-author party. Now, the author newsletter is big, and growing your subscriber list with multi-author promotions. All those other things still work, but not to the extent they used to. So, I try to do a bit of everything for my stories. It’s hard to do everything, but I pick a few things that work for my book and schedule, and go with them. Cara Bristol: What is your writing process/writing work day like? Jessica Subject: My work day involves so many things. I have to get the hubby out the door and the kids off to school before I do anything for myself. I usually head to fitness class first and then come home to walk the dog so she’ll let me get my work done without staring me in the face. Sometimes I have a chance to get some work done earlier, but often not until just before noon. I’ll work on responding to emails, doing blog posts, and doing audio book and newsletter work for Decadent Publishing for the next couple of hours. Then I have a late lunch. After that, I get some time to work on my own stuff before I have to pick up the kids from school. It may be plotting a new story, writing, or editing a finished one. If I haven’t gotten enough done during the day, I’ll work on some stuff after the kids go to bed. Cara Bristol: What do you like to do when you’re not working? Jessica Subject: When I’m not working, I’m usually doing something with the family, walking the dog, at fitness class, or reading. When I’m doing housework, I’ll often listen to an audio book, or music. Honestly, if I stop, I fall asleep. So, I keep going until I’m done for the day. 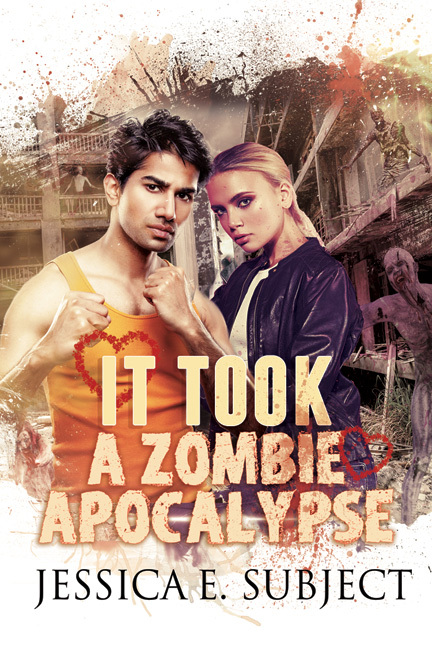 Cara Bristol: What do you think is the appeal of zombie books? Jessica Subject: I think it’s fascinating to see how people will react in an apocalyptic situation, whether it be zombies, an EMP, or something else. In those situations, we truly see the best and the worst in people. The social aspects appeal to me, but I honestly can’t speak for anyone else. 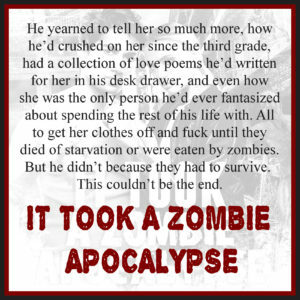 Cara Bristol: What inspired It Took a Zombie Apocalypse? Jessica Subject: It was a dream that I just couldn’t shake. 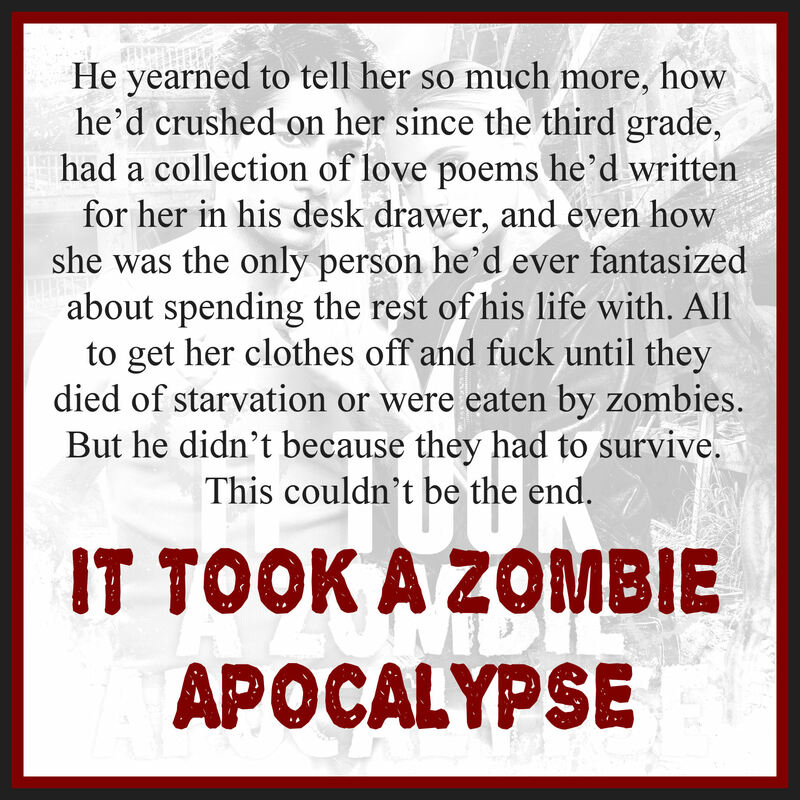 I had other dreams about zombies after watching zombie tv shows and movies, but this one demanded to be written. 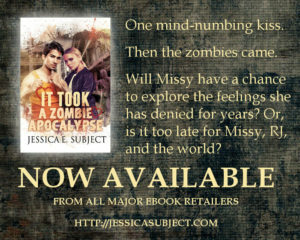 This entry was posted in Author interviews, Guest blogs and tagged author interview, college age, first kiss, forbidden love, girl next door, guest blog, interracial, It Took a Zombie Apocalypse, Jessica E. Subject, multicultural, New Adult, new relationship, new release, romance, Scifi, small town, virus, zombie, zombie apocalypse. Bookmark the permalink. Thank you, Lea! I get so many story ideas from dreams. Some turn into books, but most are still in my idea folder. 🙂 Thanks for stopping by! It does sound good, doesn’t it?I have it in my Kindle. It’s next on my list. Thanks for visiting, Lea. I’m always happy to feature you on my blog! Enjoyed both the interview and the excerpt. Thanks!